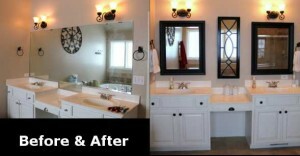 This before and after image accompanies an article on our site about remodeling bathroom mirror areas. We also have included helpful video demonstrations that are directly related to this particular “DYI” project. The old style wall mirrors are fading out of style. These days the more contemporary look leans toward hanging decorative wall mirrors. This can be an economical alternative to having a full size piece of wall mirror installed by a glass company. As you can see by the before and after photo of this bathroom mirror remodeling project, the decorative style looks more high-end.